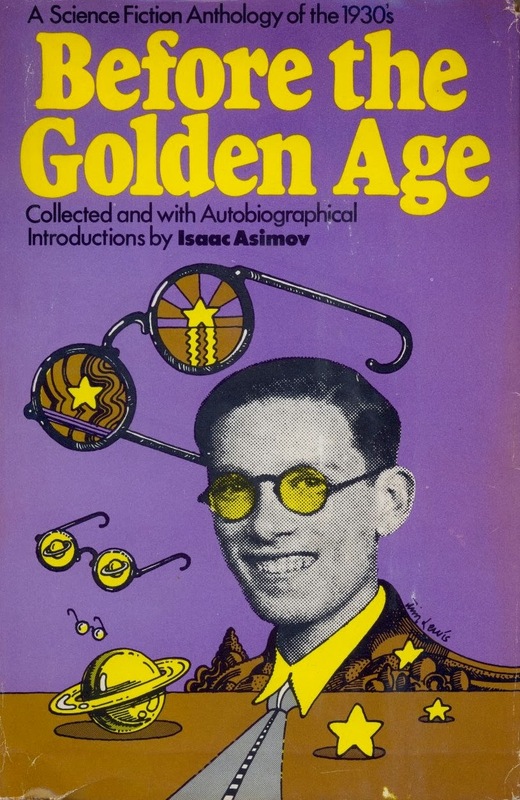 I have owned a hard cover copy of Isaac Asimov’s Before the Golden Age: A Science Fiction Anthology of the 1930s for some years, and read many of the included stories and much of Asimov’s autobiographical material. (Alas, the groovy purple and yellow dust jacket was long ago destroyed in a move.) Last night I reread the three Edmond Hamilton stories collected in it. While Hamilton wrote many action-packed stories about wars in outer space, these three works chosen by Asimov are more cerebral, consisting largely of dialogue and documenting the exposure of human beings to realities they would prefer to remain ignorant of. “The Man Who Evolved” (1931) starts like a H. P. Lovecraft story, with the first person narrator telling us “I try vainly to forget…that night a fate whose horror none could dream…” befell his buddy, Dr. Pollard, and drove his other buddy, Dutton, insane. Dutton and the narrator, on that fateful night, went to visit Pollard in his big house on the Hudson, where, in his lab, he demonstrated to them his latest experiments in biology. It is cosmic rays, Pollard tells his old college chums, which cause evolution. Pollard has constructed a machine that can collect cosmic rays and concentrate them; he believes that by directing the rays from his machine onto a subject animal he can cause it to go through fifty million years’ worth of evolution in a mere fifteen minutes. (Pollard throws reproduction and natural selection right out the window.) Pollard’s main interest is in answering the question, “how will man evolve?” and so he instructs his friends to man the controls while he enters the machine himself to be exposed repeatedly to fifteen minute doses of the concentrated cosmic rays. Pollard evolves first into a super genius with the body of a Greek god, then into a man whose atrophied body is topped by a huge head, a man who has lost all empathy and compassion but gained terrific mental powers (“I can destroy all life on earth from this room, if I desire…I will own them and this planet as you might own a farm and animals!”) As he continues to evolve, Pollard’s body is diminished until he is simply a giant brain which has lost all ambition and emotion, save curiosity, the desire to see the next and final step in evolution! After the last dose Pollard is reduced to a primordial ooze – the narrator tells us that “man’s evolution was a circular one, returning to its beginning!” Dutton goes insane, and in his raving causes a fire which destroys all evidence of Pollard's experiment. Hamilton is a good writer, and he tells this absurd story with gusto, so I enjoyed it. When I was laughing I was laughing with Hamilton, not at him. In his afterword, Asimov tells us that, even though Hamilton got his science all wrong, these kinds of SF stories are good at inspiring in readers an interest in science. The odd thing, to me, is how scientist Asimov totally ignores the story’s implication that maybe intelligence and knowledge are not always a good thing, but can expand the scope of human evil or engender apathy and despair. “The Accursed Galaxy” (1935) stars New Yorkers Adams, a newspaper reporter, and Peters, a scientist. Adams works at one of the more sensationalistic papers, and much of the humor is derived from Peters' denigration of Adams’ paper, which he calls a “filthy rag” and denounces because a science article written by Adams contains "no less than thirty errors." Adams witnesses an alien craft crash landing in a remote area, and after bringing Peters to the scene they strive to open the artifact. The craft is a prison, holding an immaterial alien made of “force.” Through telepathy (which appears in every one of these stories), the alien tells the story of his crime, and of the creation of material life. At one time all life in the universe consisted of immortal force creatures. But then the prisoner, while experimenting with matter, accidentally brought some matter to life. This life spread throughout the universe like a disease, despite the best efforts of the force creatures to stamp it out. Eventually the force creatures resorted to quarantining infected solar systems in the center of the universe, and propelling galaxies of clean systems away – this explains the expansion of the universe observed by scientists via the phenomenon of red shift. It is our own galaxy which is accursed, and we ourselves are the curse! Like the narrator of “The Man Who Evolved,” Adams declares that he will try to forget the horrible truth he has learned. This story is good, though not as fun as “The Man Who Evolved.” “The Accursed Galaxy” is part of the SF tradition of stories in which mankind, rather than being something special, is revealed to be just the cast off junk of superior aliens. “Devolution” (1936) is the craziest of the three stories, and pushes the themes of the other two stories to the limit. The scientist in this tale declares to his two friends, as they camp in the Canadian wilderness, that it is not cosmic rays, but radiation from “radioactive deposits inside the earth” that is the driver of evolution. Later, the three men are accosted by giant translucent blob aliens, single celled creatures who can fly through space without the need of a vehicle. Two of the men try to shoot the aliens, and are killed instantly by the alien’s unstoppable mental power. The less aggressive scientist is held captive while the aliens examine his mind, tapping the racial memories stored within to reveal the secret history of life on Earth! Millions of years ago the blob aliens, wielders of super mental powers, colonized every solar system in the universe. On only one planet, Earth, did they encounter any trouble. Radiation from deposits in the Earth afflicted the single-celled beings with a dreadful disease, and they developed multiple cells, then eyes, bones, scales, claws, hair. As they became more diverse, more variegated, they gradually lost their mental powers. The dinosaurs, mastodons, and apes tried to send out a mental distress signal to their fellows who ruled every other system in the universe, but it was too late, their minds were too degenerated. Then, came the final degradation: the once proud creatures of perfect intellect had devolved into human beings, creatures so insane as to indulge in mass fratricide on a regular basis. The aliens flee the Earth in disgust, and the scientist, unable to live with what he has learned, shoots himself. This story gets points for its bizarre world-turned-upside-down concept and for its breathtaking audacity, and it certainly brought a smile to my face. It is hard to describe "Devolution" as a good story in any conventional sense, but this sincere effort to “blow your mind” gets a thumbs up from me. I am not fond of Asimov’s fiction, but I have to say the autobiographical sections of Before the Golden Age are quite fun, and definitely worth a look for those interested in the history of SF. I am a sucker for “I grew up in New York City” stories, and Asimov’s bragging about his superior intelligence, his success as a writer, and his success with women is more amusing than irritating. 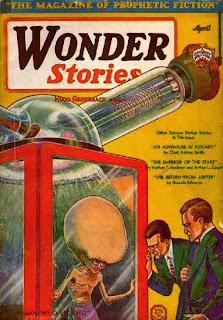 He writes quite a bit about the different SF magazines available in the 1920s and ‘30s, which stories had an impact on him and on the field as a whole, his admiration for the likes of Hamilton, Stanley Weinbaum and Jack Williamson, and his revulsion at the Weird Tales crowd and E. E. Smith. I have the single volume hardcover by Doubleday, but it appears that the book is also available in several multivolume paperback editions.